Throw your best fiesta themed party, and give ‘em something to taco ‘bout—your party hosting skills! If you’re hosting this year’s Cinco De Mayo bash, planning a fiesta themed bachelorette party or just looking for an excuse to serve chips and salsa, you’ve found your one-stop-shop for planning tips, fiesta themed party favors and Mexican themed party supplies. 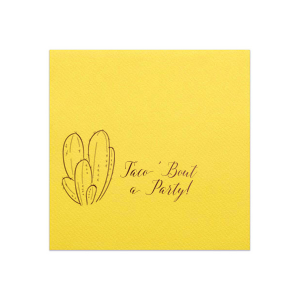 From cactus cocktail napkins to sugar skulls on party cups, we have top-quality, brightly colored party supplies that you can personalize with all your best fiesta puns. There are a few main components to throwing any party, and you can design the details in each to execute your theme like a pro! Think about the party food, drinks, entertainment, decoration and favors. Mexican themed, fiesta themed, Cinco De Mayo themed—whichever way you look at it, you’re sure to have a great number of delicious dish options. Nachos, tacos and burritos are always a crowd favorite. Mexican street corn? You’ll need more than you think. Not to mention all the different types of salsa you can make! Consider offering a classic pico de gallo alongside something a little more adventurous like mango habanero or roasted pineapple salsa. And of course...never forget the guac! Serve your meal with brightly colored foil stamped luncheon or dinner napkins to showcase your theme from the food to the table. Naturally, you’ll want to serve your favorite classic margarita recipe. You can also serve up Corona, Jarritos juices, lime infused water and all the tequila-based mixed drinks. 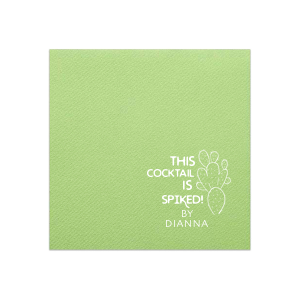 Pair your drinks with personalized cocktail napkins featuring your current favorite cactus pun, “Yeah, it’s spiked.” Create your own plastic cups that can feature your theme as well! Or even fun shot glasses that are perfect for bachelorette and Cinco de Mayo parties. Entertain your guests with the now classic photo booth—think of all the fun props! Bringing in a mariachi band or building a curated Spotify playlist are also highly recommended. Decorate your fiesta themed party with brightly colored tassels, or even make your own tissue paper flowers. Piñatas are an entertaining game that also doubles as fantastic decor! Add some life to your tables by saving the tomato cans from the salsa and fill them with flowers for themed vases. End the party by bust out your best succulent skills and gifting mini succulents as party favors! Or mini maracas….anything mini. A party as fantastic as your, guests are sure to want a little something to remember it by!